Does this non-signature guitar stand up without rockstar endorsement? The MA is a finely executed Tele-meets-Les Paul design that deserves to be on the radar of every working guitar player or enthusiast. Build quality and style. Playability and feel. Sounds. The side dots aren't too visible. This is a guitar capable of plenty of styles. The bolt-on maple neck has Manson's usual soft 'V' profile. Functional, simple and elegant, the MA-2 peghead ticks all the boxes. Hugh Manson enjoys a reputation as one of the UK's most experienced and respected guitar makers. A career that spans over 30 years, a highly successful retail store and high profile clients - not least Muse's Matt Bellamy and Led Zep's John Paul Jones - means that he rarely has a spare minute. Yet as with so many independent guitar makers, his own creations - even in limited runs, such as the most recent tech-loaded MB-1 - never come cheap. "With heavier gains the smooth playability allows all sorts of fun, but throughout the mayhem it remains characterful, not just powerful." With the recent formation of Manson Guitarworks and the introduction of his first own-design, offshore-made series, however, that all looks set to change. "Firstly, I don't do the woodwork," confirms Manson. "I designed the guitars, I went to the factory and checked it out because after 30 years of guitar making and building up what I hope is a good reputation, I didn't want to lose that overnight. "So I wanted to go out, look at the machinery, the wood and talk to the people and check out that what I'd designed they'd actually made. "It's the factory that makes our John Paul Jones signature bass, which I consider to be of really high quality. John has put his name to it and there's no way he would have done that if he hadn't been happy. I wouldn't have even entertained the factory if I hadn't been happy with their whole ethos and history of work." Those readers familiar with the guitars Manson has made for Matt Bellamy over the years will see some similarities here but the MA is, as Manson is very keen to point out, quite a different design. "If you put one on top of the other they are extremely different. The top horn on Matt's guitar is enormous. Visually, I find it too big but that's personal choice - no two people have the same view. But to me that horn is too big, so the MA's is smaller. "Then there's more of a flow from that horn into the treble cutaway - the Celtic curve if you like, it's more of a fluid curve. The cutaway is slightly deeper too and it has a rounded, not pointed, horn." With a full 648mm (25.5-inch) 'Fender' scale length, the MA's geometry is similar to a Telecaster, although a tighter waist makes the upper and lower bouts a little more pronounced, and then the treble cutaway sits deeper into the body, while the horn is more Les Paul-like. Add in the beautifully rounded forearm contour and rear tummy cut, the Les Paul Junior-ish mirror scratchplate, a less Fender, more Les Paul-like bridge and dual pickups, and we have a unique but comfortingly familiar design. The maple neck bolts to the alder body in Fender style, while the soft 'V'-profile is a Manson hallmark. "Yes, the neck shape is totally me. It took a few attempts to get it right. We also had a few attempts to get it to sound right," a major consideration being the truss rod. "The MA-2 has a single acting truss rod loaded into a routed channel that's the same shape as the rod - there's no air in the neck and less metal too." With its compound radius the fingerboard and neck feel is quite modern, very slick and very smooth. The medium jumbo frets are perfectly finished; there are no face dots, just small and rather hard-to-see side dots placed on the joint line between the rosewood 'board and the maple neck. With a design that's very Telecaster-based it's perhaps a surprise to see that Gibson-style bridge/tailpiece arrangement. "I far prefer the Les Paul bridge arrangement in terms of a piece of machinery and its adjustability, but it's also about the feel of the string. When a string comes through the body with a really steep angle over the bridge - as on a Telecaster - it feels very different to that lovely long two-inch gap between the tailpiece and the bridge. "I went to the factory and checked it out because after 30 years of guitar making and building up what I hope is a good reputation I didn't want to lose that overnight." "That shallow angle results in a totally different feel: that's what I wanted. I just like the feel of that arrangement, I feel it makes string bending far more pleasurable. It's very smooth." But Manson believes this arrangement also contributes to creating a more "mid-pushed" (Gibson-like) tonal goal. Another factor is the weight: for the style it verges on the heavy side. "As I say, the platform the string is vibrating on is meant to be mid-pushed and that requires some weight too." The major difference between the MA-2 and its sister guitar, the MA-1, is the pickup arrangement. 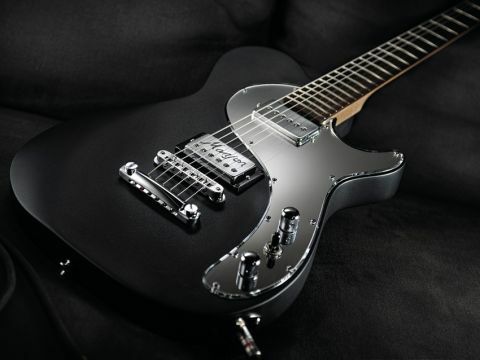 While the MA-1 uses off-the-shelf Seymour Duncan humbuckers (pre-fitted along with the electronics in the Czech Republic), the MA-2 uses the Manson/Bare Knuckle humbucker and humbucking- sized P-90-style single-coil set beloved by Matt Bellamy in recent years. These more expensive UK-made pickups are fitted, along with the electronics, in the UK by the Manson Guitarworks team. The MA-2's sounds are certainly the result of what is an interesting blend of ingredients. The alder body/bolt-on maple/ rosewood neck clearly references Fender, but the Gibson-like bridge set-up and beefy, hot but harmonically rich bridge humbucker create a very different flavour. Through a clean Fender amp, that 'bucker has quite a round-nosed smoothness to the note attack, lacking a little high-end zing with, by design, plenty of fuller midrange. The neck single-coil certainly restores some cut but with a smooth, bell-like tonality that's almost old Les Paul-like, and certainly rounder, warmer and fuller than a Strat's neck position. Swapping to a Telecaster reminds us how far it is removed from that tone - overall the MA-2 certainly exhibits much more of a Gibson's powerful warmth. The mixed pickup position brings in some handy rhythm snap and with the right amp tone is quite classic sounding. Using just the volume and perhaps a gain boost with the neck and mixed pickup positions alone would get you through many a classic soul, funk or blues gig. Light to medium gains begin to take us off in a more obvious rock direction; the bridge humbucker's powerful edge easily does those halfway clean- to-crunch sounds and, combined with the sustainful ring of the guitar, ticks the rock rhythm box nicely. But kick in a level boost, or move to a more gained amp channel, and the MA-2 really comes alive. More like the power rock of Matt Bellamy, there's power and sizzle from the bridge humbucker and hot single-coil raunch from the neck pickup - it's the sort of performance that would suit anything from more player or enthusiast modern Texas blues through to classic era Van Halen and beyond: an almost timeless character. With heavier gains the smooth playability allows all sorts of fun, but throughout the mayhem it remains characterful, not just powerful. As with any good guitar it's hard to put it in one stylistic camp and Manson's 'halfway' tone description seems pretty much spot on. Are there any downsides? Well, not if you understand the aim. It's not a Telecaster and it doesn't capture the really deep lows of a cranked Les Paul, but its musical middle ground is extremely appealing. It could do with some more visible side dots though. Great design is all about subtlety and the MA has it in bucketloads. It may start with an altered Telecaster platform but the combination of carefully considered neck and fingerboard tweaks, the Gibson-style bridge set-up, not to mention the pickup choice, create a guitar that embodies Manson's considerable experience. It's not about replicating the past, nor a futuristic vision: instead it's a real hybrid design that is very in-tune with the needs of serious performing musicians. Its "mid-pushed" tonal aim makes it superb for a wide range of rock styles, but that neck single-coil adds a fatter Fender-style edge that easily produces classic, cleaner voices as well. Here's an instrument that draws on all the vast experience of one of the UK's finest guitar makers at a far from custom guitar price. You'd be barking mad not try one.